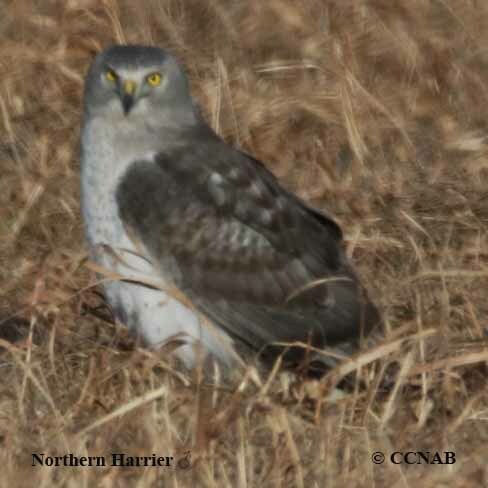 Species; The Northern Harrier (Circus hudsonius), once known as the "Marsh Hawk" is the only harrier seen in North America. 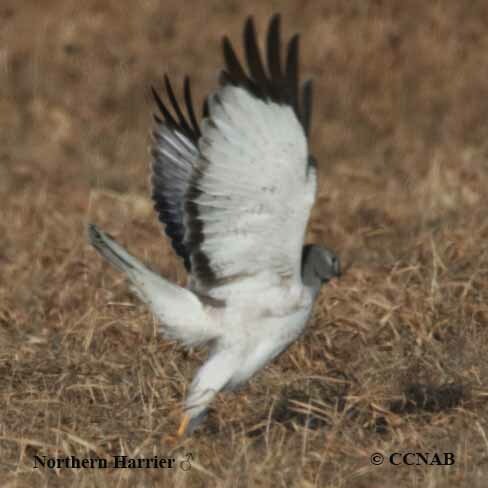 Easily recognized by its flying patterns, dihedral positioned wings, as it swoops and glides just over the tops of marshes and fields, falling upon their unsuspecting prey, unlike most raptors that dive from higher heights. 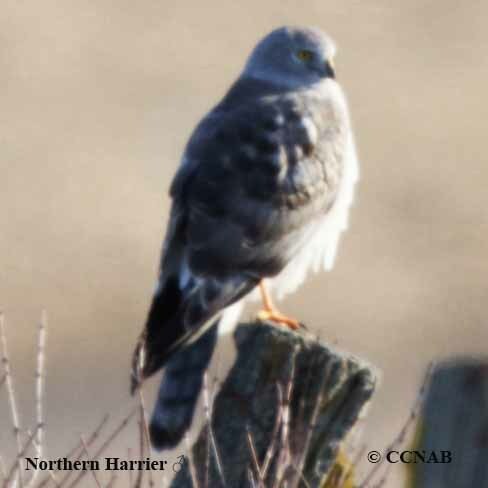 It was given such a name for the fact, that the Northern Harrier breeds in the northern regions of Canada and the state of Alaska during the summer months. 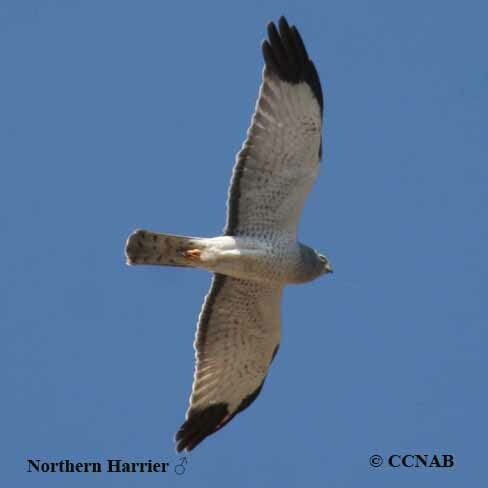 Distinctions; Sexually dimorphic, whereas the male's plumage is a medium grey tone, mostly white underbody, with some rufous or orange streaks and markings on breast, long slender wings, with black wing tips. 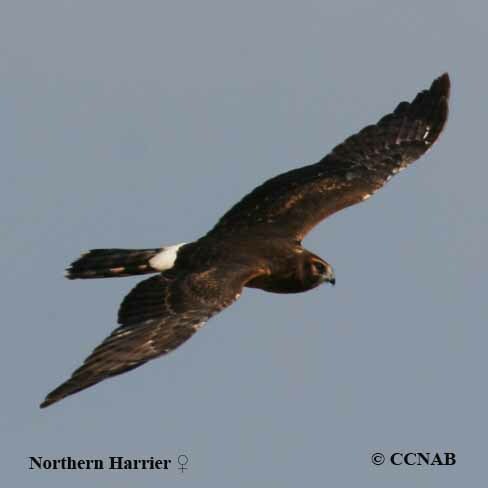 A very noticeable white rump patch (seen on all sexes). 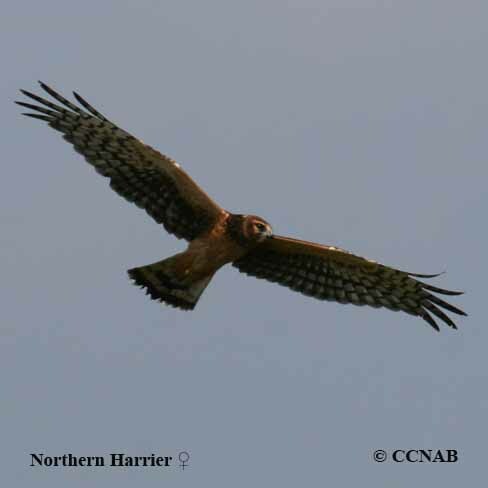 Female is larger than the male, brownish body, juvenile similar to female but more rufous-coloured than brown. All sexes have noticeable facial disk, most obvious on the male. Voice; Both sexes vocal at times, somewhat similar to other raptors, sounding like ke, ke, ke, ke. Nesting; Three to four bluish-white, brown spotted eggs, one brood per year. 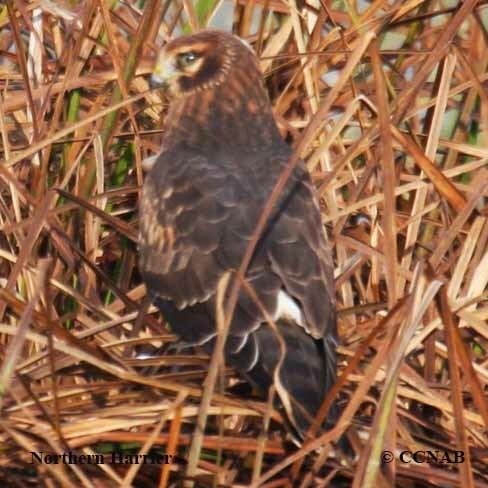 Builds its nest in marshes, meadows or hay fields, and the nest is built using branches, sticks and grasses. Distribution; Seen throughout the Northern half of North America in the warmer months, breeds year around through the central regions of the continent, spends its winters in the most southern US states, through all of Mexico and some Central Americn countries.